Not to be confused with Marion, Arkansas. Marion County is located in the Ozark Mountains in the U.S. state of Arkansas. The county is named for Francis Marion, the famous "Swamp Fox" of the Revolutionary War. Created as Arkansas's 35th county in 1836, Marion County is home to one incorporated town and four incorporated cities, including Yellville, the county seat. The county is also the site of numerous unincorporated communities and ghost towns. The county included part of what is now Searcy County, Arkansas, with many opposing to dividing them, which helped fueled the bloody Tutt-Everett War between 1844 and 1850. 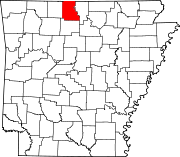 Occupying only 598 square miles (155,000 ha), Marion County is the 18th smallest county in Arkansas. As of the 2010 Census, the county's population is 16,653 people in 3,531 households. Based on population, the county is the twenty-seventh smallest county of the 75 in Arkansas. Located in the Ozarks, the county is largely covered with rugged terrain and waterways, with the exception of King's Prairie in the southwestern portion. It is drained by the White River, Buffalo River, Crooked Creek, and the Little North Fork of White River. Protected areas of the county include Bull Shoals-White River State Park, Ozark National Forest, the Buffalo National River and four wildlife management areas (WMAs). Although no Interstate highways are located in Marion County, two United States highways (U.S. Route 62 [US 62] and US 412) and six Arkansas state highways run in the county. Marion County was formerly home to a large zinc mining industry. The ruins of the Rush Creek mining district are preserved as the Rush Historic District, which is listed on the National Register of Historic Places. According to the U.S. Census Bureau, the county has a total area of 640 square miles (1,700 km2), of which 597 square miles (1,550 km2) is land and 43 square miles (110 km2) (6.8%) is water. As of the 2000 United States Census, there were 16,140 people, 6,776 households, and 4,871 families residing in the county. The population density was 27 people per square mile (10/km²). There were 8,235 housing units at an average density of 14 per square mile (5/km²). The racial makeup of the county was 97.52% White, 0.12% Black or African American, 0.76% Native American, 0.20% Asian, 0.05% Pacific Islander, 0.13% from other races, and 1.22% from two or more races. 0.76% of the population were Hispanic or Latino of any race. There were 6,776 households out of which 26.00% had children under the age of 18 living with them, 61.30% were married couples living together, 7.40% had a female householder with no husband present, and 28.10% were non-families. 24.90% of all households were made up of individuals and 12.40% had someone living alone who was 65 years of age or older. The average household size was 2.36 and the average family size was 2.79. In the county the population was spread out with 22.10% under the age of 18, 6.00% from 18 to 24, 23.30% from 25 to 44, 28.50% from 45 to 64, and 20.00% who were 65 years of age or older. The median age was 44 years. For every 100 females there were 97.90 males. For every 100 females age 18 and over, there were 94.80 males. The median income for a household in the county was $26,737, and the median income for a family was $32,181. Males had a median income of $22,877 versus $17,729 for females. The per capita income for the county was $14,588. About 11.50% of families and 15.20% of the population were below the poverty line, including 23.50% of those under age 18 and 14.40% of those age 65 or over. Note: Unlike most Arkansas counties, Marion County only has one single township (named "Marion County"). That township encompasses the entire county. Townships in Arkansas are the divisions of a county. Each township includes unincorporated areas and some may have incorporated towns or cities within part of their space. Townships have limited purposes in modern times. However, the US Census does list Arkansas population based on townships (often referred to as "minor civil divisions"). Townships are also of value for historical purposes in terms of genealogical research. Each town or city is within one or more townships in an Arkansas county based on census maps. The townships of Marion County are listed below with the town(s) and/or city that are fully or partially inside them listed in parentheses. ^ Gannett, Henry (1905). The Origin of Certain Place Names in the United States. U.S. Government Printing Office. p. 200. https://books.google.com/books?id=9V1IAAAAMAAJ&pg=PA200. ^ a b "State & County QuickFacts". United States Census Bureau. http://quickfacts.census.gov/qfd/states/05/05089.html. Retrieved May 23, 2014. ^ Arkansas State Highway and Transportation Department. General Highway Map - Marion County, Arkansas (Map) (2008-04-15 ed.). http://www.arkansashighways.com/maps/Counties/County%20PDFs/MarionCounty.pdf. Retrieved 2016-06-06. ^ U. S. Census Bureau. 2011 Boundary and Annexation Survey (BAS): Marion County, AR (Map). http://www2.census.gov/geo/pvs/bas/bas11/st05_ar/cou/c05089_marion/BAS11C20508900000_000.pdf. Retrieved 2011-08-23. This page uses content from the English language Wikipedia. The original content was at Marion County, Arkansas. The list of authors can be seen in the page history. As with this Familypedia wiki, the content of Wikipedia is available under the Creative Commons License.